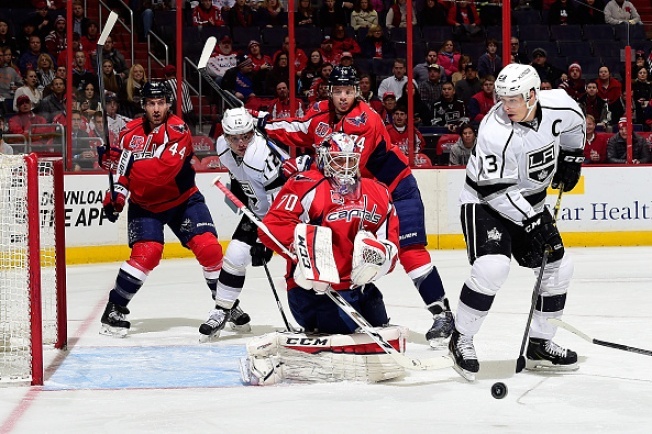 A team dinner planned by Carmen Brouwer to commemorate her husband's 500th NHL game awaited, but first Troy Brouwer and his Washington Capitals teammates had to digest their 4-0 victory against the Los Angeles Kings. The Capitals, they of the one win in their previous seven games, had forcibly ushered the defending Stanley Cup champions from Verizon Center. The Kings slogged through the congested neutral zone as if it were a tar pit, failing to gain much traction offensively. Three of the Capitals' reconfigured forward lines scored at even strength. They were disciplined, only needing to kill one penalty. Braden Holtby, barely tested, earned his second shutout in three starts, his regulation scoreless streak nearing 200 minutes. If the blueprint of a consummate Capitals performance was etched against the Pittsburgh Penguins last week, coincidentally also a 4-0 win buoyed by a 27-save shutout from Holtby, it was refined against the Kings. "We’ve got a couple games we’ve played this year, the Pittsburgh game last week being another one, when you want to see what our game is modeled after, you look at those two games," said Brouwer, who scored twice. "When you want to refer back to past games and see how we've played and see how we were so successful, tonight is going to be one of those games on the clips that we want to watch to make sure we're getting better and continuing to do what we did tonight, and if we play the way we did tonight, we’re going to be in, if not winning, the majority of our games the rest of the way." During the season's first month, the Capitals endured a five-game losing streak, which Brouwer admitted Tuesday morning had induced some panic. The same, however, could not be said about Washington's recent 1-4-2 hiccup, he maintained, though it certainly seemed more jarring when juxtaposed with the 14-1-4 run through December and January that immediately preceded it. "Our team's playing very structured right now," Holtby said. "I think that little losing streak was a big wake-up call for us. Now it’s a matter of keeping it going and still realizing we have a lot of improving to do. "I think we were getting away with things before that, and that losing streak proved that we can't get away from the style of game we want to play. ... The way we were playing wasn't our identity. We weren't making the other teams really earn the wins as much as they should have been." In winning two of the past three Stanley Cups, the Kings relied on a bruising, chew-you-up-and-spit-you-out style, churning out line after equally dangerous line and providing little respite for opponents. In a way, the Capitals resembled that relentless team Tuesday, reminiscent of the group that recently inspired confidence and could inspire fear in the playoffs assuming they qualify. "We go over details and structure and order every day," MIke Green said. "It's just a matter of us sort of focusing on it. When we execute that game plan, we're pretty successful. It's just a matter of being consistent in that sense."